Now how could this be true? I was worried, listening to the undoubted wisdom of these mountain dwellers. Because though it sounds silly to say, Martha Pettry’s least favorite berry played a crucial role in some of my most foundational experiences. Or, the mulberry was the grounding force of one glorious season in which I found myself falling into the rest of my life. It was 2005, the summer after graduating from college, and all my friends and I lived within a 2-block radius of each other in the Old Fourth Ward of Ann Arbor. We were working minimum-wage summer jobs, or none at all, and were aimless, carefree on the outside, and scared to death for the future on the inside. Our nights were full of drinking and music-playing on the porches of our dilapidated rented Victorian houses. We had dance parties and bar crawls, nightly excursions to the lake for moonlit skinny-dipping, and we picked mulberries. Ann Arbor yards are full of mulberry trees. In the summer, weighed down branches hang low over the streets, and the wind-fallen purple berries coat and stain the sidewalks below. One Saturday, on a walk home from the farmers’ market, where a friendly rhubarb farmer handed me a piecrust recipe, I walked under one of these trees. I paused to try a berry, went directly home to get a bowl, walked back to the tree, filled the bowl with fruit, and went back to make my first pie. That mulberry pie launched a pie-making obsession. I soon invited my lady friends over to make pies, and those hours of girls chatting in the kitchen became a counterpoint to our wild summer nights. As we mixed fillings and rolled out crusts, we talked about our grand futures—what city we might move to in the fall, what projects we wanted to start, what we hoped to do with our English degrees—as well as more immediate plans: where the party was, or who we wanted to kiss by the lake that night. We rallied crews of berry pickers. We’d go out, often at night with chairs or ladders to reach the tallest branches, venturing out further and further until all the trees in the neighborhood were picked clean. Since the berries were free, I donated my pies to worthy causes of my own benefit—leaving them on the doorsteps of neighbors, friends, or boys I had crushes on who had as of yet been inattentive; hoping that in that crust-encased mess of watery purple juice they might discover some yet untapped love for me, and then somehow, we’d never have to grow up, or leave our college town, or jump off into the abyss. On the night of the solstice, overcome by the full moon, my best friend Heather and I held an inebriated celebration. In both self-aware silliness and complete seriousness, we paid homage to the season. We made up our own solstice rituals, which involved writing our secret desires on slips of paper, burning them, and casting the ashes out into the wind. We streaked our faces with mulberries, unaware that the juice does, in fact, stain skin. As Heather attempted to skulk home that night, she ran into her recent ex-boyfriend, who asked what was on her face. She pushed by him and curtly replied, “blood,” hoping that he might be so intrigued by this that he might pursue her again. Who could leave such a mysterious and bold woman? So the mulberry became our bravado. And though no one fell in love with me— and it later came out that the purported blood was merely berry juice—the friendships from that summer remain strong. When I step back from the sweet nostalgia, though, I remember the berry-slick sidewalks that were more treacherous than ice; their fermented smell, like old spilled wine; the mulberry stains that never came out of my favorite dresses; the watery, occasionally insipid flavor; how difficult the berries are to de-stem and bake with. After all, I can’t recall the last time I’ve seen them on a restaurant menu. So is it true then, that the mulberry is indeed the worst berry there ever was? The red mulberry tree originated in Eastern North America and is most prevalent in urban neighborhoods today; the white mulberry, though now also found in the States, is native to Asia. 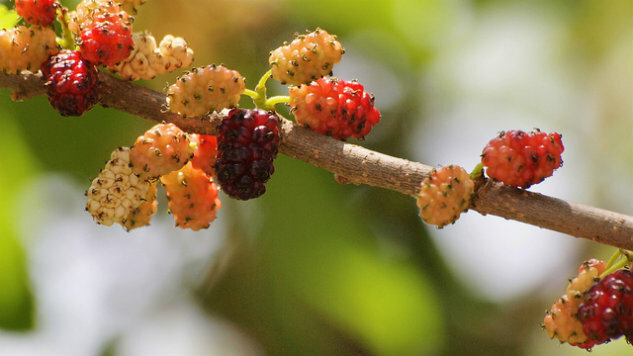 That variety was brought to England in the 17th century, in an attempt to launch a European silk industry, as mulberries boast to be the sole food source of the silk worm. This isn’t much of an argument for mulberries—it isn’t the little slimy thing that makes beautiful silk; it’s just the little slimy thing that another little slimy thing eats to make silk. Some cities have even banned mulberry trees because of their severe allergy-inducing pollen, due to a long pollination period. And as I remember now, from my attempts at stockpiling them in the fridge for future pies, mulberries don’t last. They have thin skins and a high water content, diluting their flavor and making them mold easily. All of this makes the mulberry a fruit that is not sold commercially. The mulberry is available only by backyard fruit or forage and only when it’s the right season. They require a good deal of work and attention, with only a very little payoff of a watery, ephemeral, labor-intensive berry. When I come to think of it, I can’t say that I’ve made anything with mulberries since that glorious summer, or that I’ve even sought them out. I definitely can’t say that I’ve missed them. But the other evening while running through my Washington, D.C. neighborhood, burning off stress after turning down a job offer that would take me hundreds of miles away and faced again with an uncertain future if I stay, I spotted mulberry trees all over, nearly slipping on the fruit smeared on the sidewalk. I stopped to try one, and all those feelings came rushing back—of impending change and fear and home. I decided to stay put for a summer, and see what the mulberry might bring. Emily Hilliard is a writer and the West Virginia state folklorist. Her work has been published by NPR, Lucky Peach, The Oxford Companion to Sugar and Sweets, and the James Beard Award-winning Gravy. She also writes the pie blog nothinginthehouse.com. Find more of her work at emilyehilliard.com.